Is The Bitcoin Focus Group a Scam? Yup, My Review Exposes It! According to the website the system is completely free & you can even get a bonus $200 just for trying it out… But is it actually legit or is the Bitcoin Focus Group a scam that’s just going to leave you with an empty wallet & a feeling of disappointment? What Exactly Is The Bitcoin Focus Group? According to the website, the Bitcoin Focus Group is a private, invitation only group that has been put together to help people generate profits from Bitcoin. You’re led to believe that each member of the group is going to be guaranteed to earn up to $35,000. But the reason I put the word luckily in quotes above is because whilst it might initially feel like luck to be accepted into such a group, sadly this whole thing is not actually quite as it seems. I can tell you right from the off that the Bitcoin Focus Group is indeed merely a scam that’s been designed to part you with your hard earned cash & I can say that will 100% confidence because I’ve seen the exact same thing before under the name of Bitcoin Bonanza. How Does The Bitcoin Focus Group Work? The truth is that pretty much everything you’re told on the Bitcoin Focus Group website is lies – the whole things just a big binary options scam & all the false hype that’s been put together is just to try & get you to deposit with their “recommended” broker. This is because the creator of the Bitcoin Focus Group, who by the way isn’t David Kramer as you’re led to believe, is earning huge commissions for each new customer he gets to sign up with the broker. The obvious giveaway that it’s a scam is the fact that there’s actually a broker involved… This may be a requirement when trading with other currencies but when trading with cryptocurrency like Bitcoin you don’t need a broker at all – all you need is a wallet, like a CoinBase wallet for example. Basically in around 2013-2015 binary options trading was huge – it seemed like an easy way for people to make money & many people got drawn into it, but the truth is the whole thing was a scam as it was all geared towards the brokers winning, not the traders. As opposed to normal trading where you buy/sell things binary options trading basically involves you “betting” on whether or not you think the price will go up or down. As I say it sounds really easy & that’s why many people got drawn in, but anyway because of the super short periods in which the bets are made over the risk is tremendous. That’s why several governments cracked down on it & binary options trading actually became banned in many of them, including the USA. Anyway, this was bad news for the binary brokers because it meant many people stopped trading. People became aware of how bad it was & how hard it was to make money so they stopped depositing. But then they came up with a plan to get people to deposit again, and that plan was to create fake systems which could supposedly guarantee the members would generate profits on autopilot. After all who wouldn’t want to try out something like that? The brokers & these fake websites (like the Bitcoin Focus Group) made out as if people could simply deposit, try it out & then withdraw their money if it didn’t work out as promised. Well sadly the brokers behind these things & the people creating the systems are unlicensed which means they’re unregulated. All these guys are set out to do is take your cash, so the second you deposit you’ll find out that the system doesn’t really work as promised & then after that you’ll be left to find out that the brokers will block or ignore your withdrawal requests. It’s just a big fat scam, covered up as an easy way to make money. The reason these binary scams catch so many people out is because they give people the impression they can just “try it out” – but as I mentioned above you can’t, if you do then you will lose your cash for good. However the problem is they’re extremely convincing & you still may not be willing to take my advice to stay away so I want to point a few of the main red-flags found on their website to help you see it’s a scam. You’re led to believe that the Bitcoin Focus Group system has been featured in several news publications but this is a complete lie. Some of the news publications stated include The Huffington Post & the Observer yet if you search any of these publications for any traces of the Bitcoin Focus Group (as shown below) you’ll see that it’s a made up claim. With the Bitcoin Focus Group being an investment scheme they are required by law to at minimum show their company details & a license number (since they have to be regulated). Surprise surprise the website shows none of these – all you get is an email address & the only “support” they appear to give you is helping get your card details from you so that they can take your money. 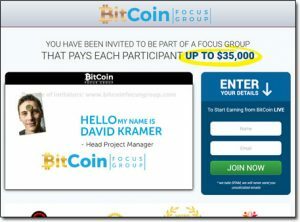 My Verdict – Is The Bitcoin Focus Group a Scam? Yes, I can say with absolute confidence that it is. At a glance it might look like a great opportunity but the reality here is that it’s been built with the sole intention of parting you with your hard earned cash. I can say for sure that if you sign up to the Bitcoin Focus Group you will not make money, all you will do is lose it. What’s worse is that they will then call you to try & get you to deposit even more by promising that “next time you will definitely profit”… Sad but true & as a result many people have lost thousands to these kinds of scams – some have even lost their entire life savings. All they’re doing is lulling you into a false sense of security so that you’ll deposit with their so-called “recommended” broker, which just so happens to be the broker that’s paying them huge commissions. Overall there is just no way I am going to recommend this system to you since it’s just clearly a re-hashed version of the Bitcoin Bonanza scam that I recently also exposed right here on this blog.